We are always on the look out for volunteers to help us in the garden. As you can see from our profiles below, we are not all knowledgable and skilled gardeners. Some of us are handymen or simply good with a sweeping brush! We are also keen to enlist the help of volunteers to open the garden gate in the morning and to shut it again in the evening. So if you are keen to help, please contact us using the Contact page or simply pop in to see us when we meet at the garden (to work!) on Thursday mornings. We may not look it but we are quite human! Julia is a founder member. 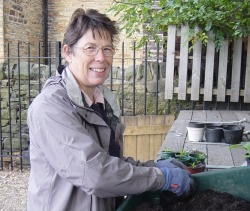 She is a keen gardener and usually organises the work programme for the volunteers. 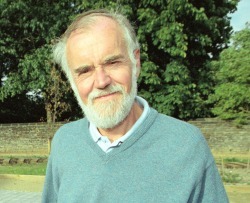 Richard is also a founder member and he is happy still to be involved. He is a keen vegetable gardener but is less knowledgeable about plants! Eddie is the original handyman in the group. He has designed and constructed many of the creative garden features such as the insect house and the plant pot man. Ruth looks after the climbing plants on the side wall and shares the task of weaving the willow tunnel. She also controls the growth of plants onto the pavement outside the garden entrance, keeping it safe for pedestrians. Avril is a keen and knowledgeable gardener. She grows plants from seed to stock the garden and has a keen eye for design. Rosemary is very well informed about plants and claims 'any attempt to tame plants is hampered by a vision of a lush paradise'. Whatever that means! 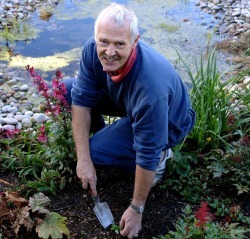 Peter's speciality is plant propagation and he has introduced some unusual plants into the garden. Unlike the rest of us Elaine is not yet retired. However, she still manages to find time to make regular flying visits (usually on her bicycle) to help us on Thursday mornings. 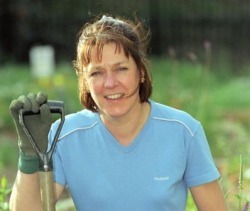 Ann is a very keen gardener who enjoys revamping existing beds. 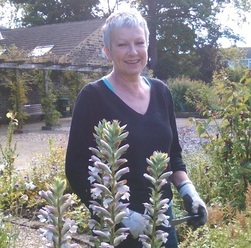 She also donates unusual plants from her own garden. Sheila organises the plants for sale and makes all the wonderful labels. Caroline is very competent and is willing to tackle any task. She is especially smiley and positive, and often bursts into song! Pam says she is a 'rookie' but she is actually quite knowledgeable. Excels with a brush and a hose pipe but not simultaneously! 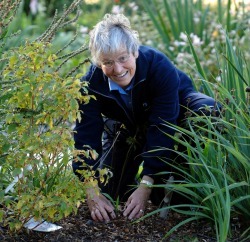 Hilary is good at general maintenance - weeding, pruning and potting up plants. However, she doesn't seem to be doing much maintenance in this picture! 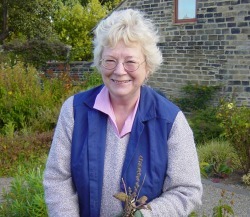 Ruth propagates plants, brings plants from home and organises the plant sales area.